"I was surprised to see that anyone was still suspecting Cheryl of being involved with Kristin's disappearance and probable murder. 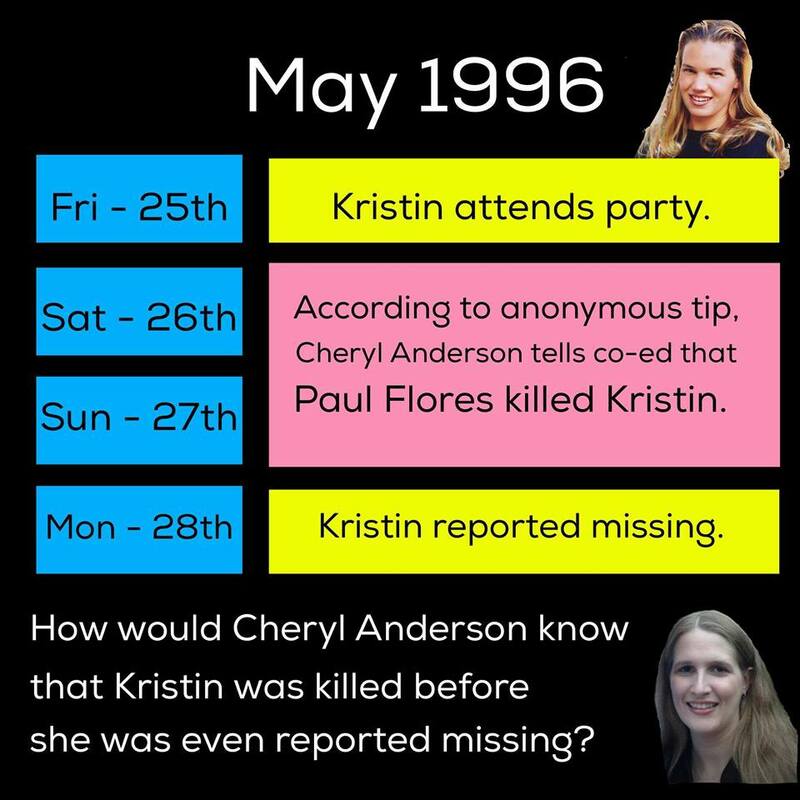 I and many other girls were with Cheryl the next day (or day after that) when Kristin was missing, and from what she said to all of us I'm sure that she had nothing to do with it, that she regrets leaving Kristin with Paul, and that Paul Flores killed Kristin. I have not talked to Cheryl since the end of that school year. I can't remember exactly what day the conversation happened. I know it was Saturday or Sunday because I had been out of town on Friday. The news about Kristin being missing had not yet hit the public. I don't think the police were treating it as a missing persons case yet, Cheryl talking about it was the first any of us had heard of it. Anyway, Cheryl was almost crying and was extremely upset about Kristin being missing. She was very distraught. She told all of us that she had been walking back with Kristin and that Paul had said he'd "take care of her" the rest of the way. ​Cheryl told us, "Well, he took care of her all right. He killed her!" I don't remember any of the rest of the exact words any more, but basically Cheryl deeply regretted leaving Kristin with him. She felt horrible about it right away, she knew what happened, and there was nothing she could do to take it back. I'm sure she's never stopped blaming herself or questioning why she left her like that. Probably a bit drunk and had poor judgment that goes with that, but I'm just speculating about the drinking. She also said (not exact words) that Paul had kept trying to get her to leave them during the walk home, but that she felt like Paul was a creep and she kept refusing, but finally when they were close to Kristin's red brick, Cheryl left them and walked back to Sierra Madre. For the mindset of her regret, understand that it's not like Cheryl felt like Paul was a great guy and that Kristin would be safe, she KNEW that Paul was creepy and that Paul was trying to get rid of her to be alone with Kristin, and that Kristin was drunk or out of it, and she finally (for some reason) ignored her feelings and left them. One tiny slip up in judgment and Kristin's dead, and nobody would do anything about it. The regret from that must be terrible, but I don't think she should blame herself. Remember that Cheryl is not the person who murdered Kristin, Cheryl was the person who tried to get her home, then had a lapse in judgment. The murderer (almost certainly Paul) is the one who is at fault for this. SO MANY college kids there walk around drunk at night, both before Kristin disappeared and after. It's a "safe" town and a sleepy campus, so nothing to worry about, right? Who would ever have guessed that something like that would really happen? We NEVER thought a fellow student would do something like this. We used to worry a bit about the people getting out of prison, especially after this when the other girl got murdered by somebody on probation or parole, but we didn't worry about other students. I can't blame Cheryl, not after knowing her and seeing her so upset over it. I don't think she knows anything else except what she's already said. I haven't heard of her story ever changing. I didn't know Cheryl well, but from everything I saw she was a quieter girl who was overall nice to people. She was often the quiet girl next to a more outgoing and (forgive me, but it's true) prettier friend. She wasn't at all the kind of person who I'd expect to be involved in something like this. We were all shocked when she was telling us. We never thought anything would happen there. Cheryl helped people, she thought she was helping Kristin, and then she messed up and left her, and I think the guilt over leaving her with him was probably too much. That's my guess as to why she has not talked publicly. Self blame. I have enormous sympathy for Kristin's family. I also have sympathy for Cheryl, as a kid who tried to help, messed it up, and has to live with letting her friend get murdered. This was upsetting for all of us who were there when it began to be known that it had just happened, I can understand why Cheryl wants to put it behind her and not talk about it. I guess if you have not been through something like this, that's hard to understand. I already told this to the FBI back when they were interviewing everybody who had been on campus. I'm sure other girls who were there also gave them the same information. I will check the Facebook group, if you have questions I'll answer them through here. ​I don't think I know much else.